After meeting Prime Minister Narendra Modi, Trump Jr. will be whisked away to another event, a dinner with buyers of Trump properties that had prompted accusations of influence peddling by ethics watchdogs. Donald Trump Jr. has been scouting deals in India for over a decade. New Delhi: Donald Trump Jr. landed in India earlier this week for a contractually obligated trip to promote his family's branded real estate projects, but controversy seemed to dog the president's eldest son at every turn. The trip was meant to climax with a foreign policy speech at a business summit on "Indo-Pacific" relations, but amid the outcry over conflicts of interest between the family business and his father's job, it was hastily changed to the more innocuous "A Fireside Chat with Donald Trump Jr."
"With this trip to India, the Trump Organization is literally selling access to the first family," said Kathleen Clark, a law professor and ethics expert at Washington University in St. Louis. "It is providing condo buyers with a chance to curry favor with President Trump through that purchase, and also giving them an opportunity for face-to-face communication with one of Trump's sons." For his part, Trump Jr., 40, the executive vice president of the Trump Organization, dismissed such conflict-of-interest concerns as "nonsense," and told reporters in a roundtable that his family had voluntarily agreed to put a number of promising deals in India on hold after his father was elected. "That will cost us quite a bit of money I'm sure in terms of lost opportunity," Trump Jr., said. The Trump Organization did not respond to emails or telephone calls requesting comment. The president's eldest son has been scouting deals in India for over a decade, work that eventually resulted in lucrative licensing agreements for two residential towers in the western city of Pune and the 78-story Mumbai project that is set to be completed next year and is supposed to evoke a glass of champagne when lit up at night. There, Trump Jr. was festooned with a jasmine welcome garland, his forehead smeared with a red vermilion powder, as he snipped the ribbon on the tower that will have its own private jet service. Plans are also in the works for an office tower and residences in Gurgaon, as well as Kolkata. In conversations with handpicked Indian journalists, Trump did once stray from the business at hand to hold forth about American mainstream media - "disgusting" - and the difficulty of being a husband and father while living in a high-pressure fishbowl and the grind of the investigation into alleged Russian involvement into his father's presidential campaign. "The level of scrutiny is ridiculous," he said. "The good thing is, after all that - millions in legal fees, hundreds of hours of preparation, every headline in the world trying to attack me personally - they kept digging and the only thing that they found is that the other side is doing these things and we didn't do anything." Trump Jr. was well-received in India, which has had largely positive relations with the Trump administration for the last year, except for some tension over trade. 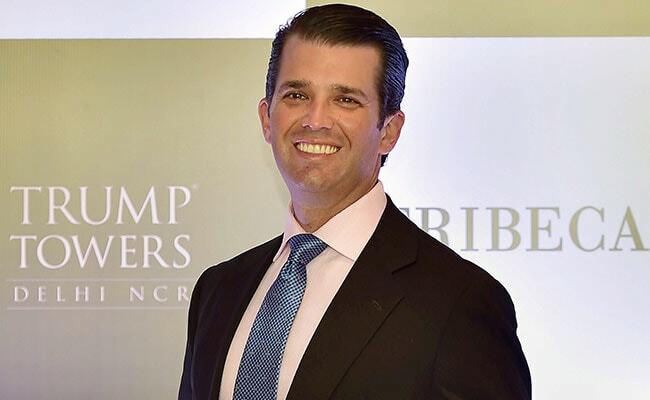 A Times of India scribe who covered the Kolkata leg of his tour wrote of that a "dapper Donald Trump Jr." was seemingly unperturbed by criticism back home and "charmed" an audience of buyers and real estate honchos at a gala dinner. Washington, of course, was less sympathetic. That same day, Sen. Robert Menendez, D-N.J., wrote a curt letter to the U.S. ambassador in India, seeking assurances that they had not helped Trump Jr. on his speech or expended funds for it, saying on Twitter the trip raised "red flags." The embassy said it had only provided routine support to his Secret Service detail. "The optics of the visit do not look good from Washington - or from any other place for that matter," said Michael Kugelman, deputy director of the Asia Program at the Woodrow Wilson Center in Washington. "Though at the same time, I think there's a realization that this is the new normal and there's not much that can be done about it." This week, a steady stream of prospective buyers came through the new Trump showroom in the burgeoning suburb of Gurgaon, eager to pay a $38,000 booking fee for luxury residences in a Trump Towers project with units selling for up to $1.6 million. When the project - a joint venture between Mumbai-based Tribeca Developers and M3M, a family business that stands for "Magnificence in the Trinity of Men, Materials and Money" - was launched in January, its promotional materials touted an infinity pool, reflexology garden and a sweeping views of an "adjoining 9-hole golf course." The golf course actually sits in the neighboring Golf Estate development, also owned by M3M, that's been plagued by delays. Disappointed home buyers said that M3M initially marketed the course as an executive-level grass playing surface, but eventually abandoned those plans and put in synthetic turf instead. M3M officials did not respond to telephone calls or a list of questions by email. Manoj Gulati, the owner of one of India's largest spice conglomerates, was among those who booked a four-bedroom apartment in the Trump Towers on Monday, a day that saw $15 million in real estate sales. Mr Gulati, who has multiple apartments across the country, decided to invest in the Trump Towers after a friend recommended it to him, not to have access to the First Family. "It was a good investment. Trump's name adds credibility to the project and I know that the construction will be good," he said.